Inject security, DLP features & HIPAA, GDPR, CCPA and other compliance policies at the core of your apps. Enrich your applications with advanced Data Loss Prevention and other security features through our complete and well documented tools. It’s divided into modules with specific SDKs for DLP, data classification, OCR, and others. It also includes language specific sets of tools and helpers for communication with sensitivity.io. 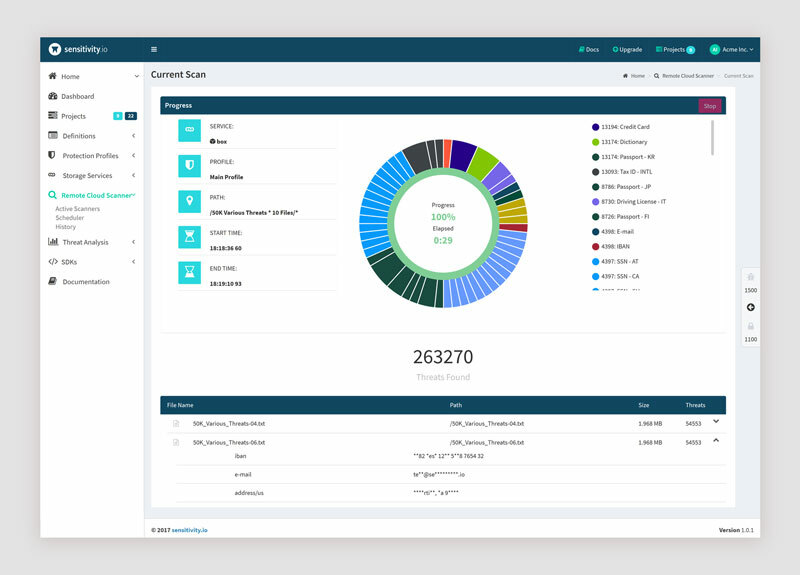 Use our Cloud Engine to get visibility into sensitive data collected and stored by your apps and services and add them to projects with specific settings and protection profiles in the sensitivity.io Control Panel. Identify, tag, scan confidential data in the cloud and apply remediation actions like encryption and deletion. We offer a powerful scanner that you can use directly on your cloud services such as Box, Google Drive, Dropbox etc to perform data inspection and discover threats based on selected protection profiles. All you have to do is connect your accounts in the sensitivity.io Control Panel and you can start scanning right away. The Health Insurance Portability and Accountability Act (HIPAA) is a set of standards created to safeguard protected health information (PHI) by regulating healthcare providers. The EU General Data Protection Regulation (GDPR) is designed to protect the privacy of EU residents. With sensitivity.io policies, you can cover an important part of the audit, tracking and reporting of transferred data outside the company. The Gramm-Leach-Bliley Act (GLB Act or GLBA), also known as the Financial Modernization Act of 1999, seeks to protect the personal information of consumers stored in financial institutions. The Payment Card Industry Data Security Standard is a set of security standards designed to ensure that ALL companies that store, process or transmit cardholder data and/or sensitive authentication data maintain a secure environment. We are strong supporters of efficient data security, with less development effort and fewer resources. With sensitivity.io, we eliminate thousands of hours of coding, offering developers APIs for highly personalized data security features.